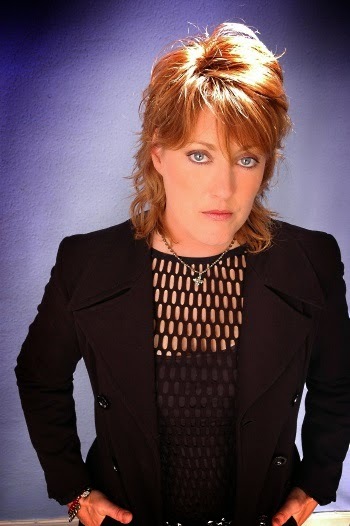 Katrina Leskanich, former lead singer of Katrina & The Waves, is getting ready to start a solo US tour (dates below). First, she spoke with us about "Walking On Sunshine," the tour, her photography book, Hanoi Rocks, and more. Let's talk about "Walking On Sunshine." It's thirty years old and you still hear it on the radio today. Did you think it would have such staying power? No, we didn't. When we were first running the song in the early '80s, Kimberley Rew, our guitar player who wrote it, presented it to the group and we though it was pretty lightweight. It wasn't really where we were at, at the time. So it was really curious that he came up with it except I know that he really liked The Supremes and he liked that beat, that "You Can't Hurry Love" beat. It was in the dead of winter, early '80s, February and he rode his bike twenty-seven miles to get to our little homemade studio. Vince the bass player's first thought about it was it was a little irritating. All I could say about it was having lived with it a couple of days, it just kept going through my head, so we thought that was quite hopeful. At the time we were doing a lot of shows on military bases, US Air Force bases and Royal Air Force bases around the UK. We would play the song and we eventually took it out of our set because it was just a dance floor emptier. People didn't really know how to dance to it. We took it out of the set, but we did have a couple of attempts at recording it. When we finally got signed with Capitol Records, they signed up a hotshot new-kid-on-the-block producer named Scott Litt. Scott was kind of a cool guy. He hadn't done a whole lot up to that point. "Walking On Sunshine" was his first hit. After that, he went on to work with R.E.M., Nirvana, Indigo Girls, and a few other very uber-cool bands. Scott had the idea to start the song with the drum introduction, which was really inspired. We went to The Power Station in New York City, which was a studio that was known for a fantastic drum sound. That's where and when we got the track. That was in '84. We had just been signed by Capitol and by '85 we released it and the rest is history. It's such an iconic song and it's been featured in plenty of television shows and movies like High Fidelity and American Psycho. What's your favorite place where it's popped up? American Psycho. That's pretty cool where Christian Bale is post-murder and he's walking down the corridor and he's got the old headphones on and he's listening to "Walking On Sunshine." When I first saw that movie, I didn't really get it. As I got older and wiser and figured it out, I saw how ironic the moment was. I didn't really get it before. I suppose it was quite cool, if not a little bit cheesy, when John Travolta is the babysitter and he's dancing with the babies to "Walking On Sunshine." That was nice. Dolly Parton covered the song. She did a very interesting version and changed some of the lyrics. Instead of "don't it feel good," she sang, "and it's time to feel good." I don't know where she looked up her lyrics, but they're not quite right. But she's Dolly Parton and obviously we all love her and she can whatever the hell she pleases. Tell us about your latest album, Blisland. Blissland is the first album I've recorded in ten years. Last year, I was invited onto a tour called Retro Futura with The Thompson Twins, Howard Jones, Midge Ure, and they all had new material. I thought, "I don't want to join this tour--and it will be the first time I've toured America in twenty years--without some new material." So I didn't know if I would be able to do it, where it would come from, what it would be about, blah blah blah. Picked up the guitar and pretty much had a go and bashed it out. I didn't have a long time to work on it, which is probably a good thing. The name Blisland is the name of a village in Cornwall, which is in the southwest of England. It's a place I like to go because it's very beautiful, a very spiritual place. Blisland, the little village, is one of the first that you get to when you're entering Cornwall. The little village probably has around 127 people in it, but they also have a lovely little pub with some fabulous ales. It was all just a very good feelgood experience so I thought, "If I ever record another album, I'm gonna call it Blisland." You're getting ready for a solo US tour. What can fans expect from the shows? I'm using three badass New Yorkers who have worked with Blondie, Joan Jett And The Blackhearts, John Cale, list goes on. These guys are cool. They've been around awhile. I played with them on Retro Futura and we just clicked. I'm paring it down to just four pieces: drum, bass, guitar, and I'll handle the rhythm guitar. I'm doing a lot of Katrina And The Waves material, some material from Blisland, and I'm doing a few cool covers, stuff that I like. Sometimes it feels like we're living in an ugly world, but it's only because we're constantly bombarded with bad news. News is everywhere. We can be attacked by news and it's all bad. I just think it'd be nice to try and turn it around and look for some joy. So I thought it's a good time to wish "Walking On Sunshine" a happy birthday and remember what it's like to just go out and have some fun. What inspired you to create Peggy Lee Loves London? Peggy Lee Loves London is a photographic book of all my favorite places in London. I've lived here since 1976 and the tour books don't know about places that someone who's lived here awhile knows about. I'm talking about pubs, clubs, bars, coffee shops, bakeries, parks, all the places I love to go. Peggy Lee is my little toy poodle and she gets in every shot. So if I take a picture in one of my favorite pubs, she's in there. Wrote a little bit about it, little captions, done. Little book. Joyful. Joyful and informative. One thing I just discovered today was that Hanoi Rocks' "Don't Follow Me." How did that come about and what was it like? In the early '80s, we were doing the rounds and we played in a club called The Moonlight. One of the guys from the music business we were working with was looking after them. He said, "Come on, you've got to meet these guys." They were so sweet. They were lovely and they said, "Can you come in and sing backup on our record tomorrow?" We'd had this huge night out and we'd all stumbled into the studio the next day. I think I sang on two tracks. We just did it in one take and it was just a really nice experience because they were really sweet. It just happened like that and probably happened as the result of quite a few pints of beer. Final question: you're in charge of a music festival and you can get any five artists, living or dead, to perform on the bill with you. Who do you choose? I would choose Mama Cass Elliot. I would choose Karen Carpenter. I would choose Nina Simone. I'm choosing all women, aren't I? Deborah Harry's always invited. I'd probably have The Shangri-Las. What song do you all perform together for the final jam? That would be "Top Of The World" by The Carpenters.